Job titles are a funny thing. For some people their title is deeply important. Other people don’t care at all. And sometimes they cause a big heap of confusion. Ian Bogost recently wrote a piece titled Programmers: Stop Calling Yourselves Engineers. His premise is that programmers who use the title engineer cheapen it. Real engineers are regulated, certified, and owe a responsibility to public safety and reliability. The article hit a nerve. Twitter and Facebook were a flurry with upset software engineers. I’ve got a pair of stories I’ve always wanted to share. They’re brief but fun and educational. Ian’s piece has given me an excuse to do so. I work as a senior software engineer in video games. My job title at any company would be some variant of engineer or programmer. My girlfriend works as a designer in the web and mobile world. She works for a client services company. They’re contracted to create websites and mobile apps for other businesses. When I first went to one of her company Christmas parties I kept getting asked if I was a developer. Which is kind of a weird question. It took me awhile to figure it out. In her world developer means programmer. The job title of someone who writes code is developer. This is different from the video games world. In video games everyone who works on a game is considered a developer. Programmers, artists, and designers are all developers. A few years ago my girlfriend was recently graduated and looking for a new job. One of her applications was for an Art Director position at an advertising company. I told her I didn’t intend to be unsupportive but was she sure she was qualified to be an art director? This is what we call a learning moment. You see in video games an art director is top of the artist food chain. The highest rung on the ladder. A project will only typically have one art director and they run the show. It’s a position that often requires 10+ years experience. In advertising, art director is the ladder. There are senior art directors and junior art directors. There are even art director interns! 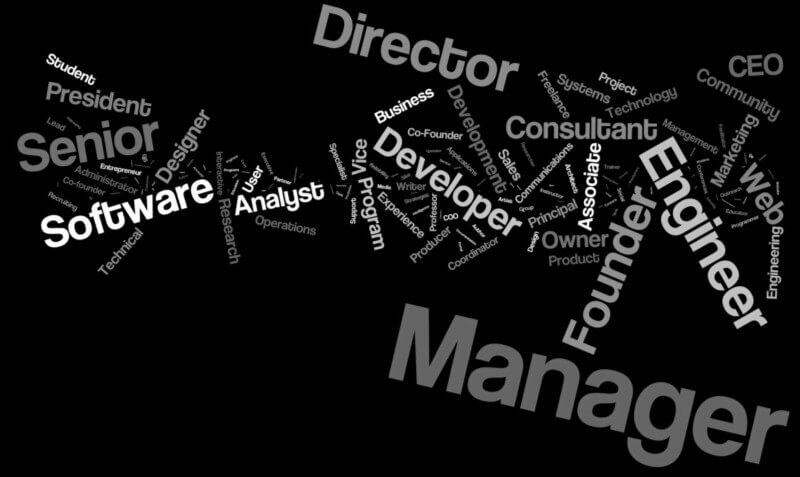 Job titles mean different things in different industries. It’s fine. In video games “developer” refers to anyone on the team. There are more than a few cases where artists or designers have been offended over not being considered a developer. In the web world “developer” exclusively refers to programmers. Programmers are developers and not programmers are not developers. In video games “art director” is a high-level top-of-the-ladder position. In the ad agency world “art director” has senior, junior, and even internship rungs. They’re just words. Words which are overloaded to mean different things in different contexts. Words which change over time. It’s fine. It’s surprising how often I get to tell these stories. They’ve defused more than a few situations. As titles cross-pollinate across industry lines there is bound to be confusion. People are quick to get upset. It’s often a simple matter of the same word meaning a different thing in a different industry. Let me know if you have a good example of the same job title meaning different things in different industries. I’ll add it below. In industrial design, a Product Designer is someone who designs, models, and builds physical prototypes for goods such as phones, appliances, and tools.